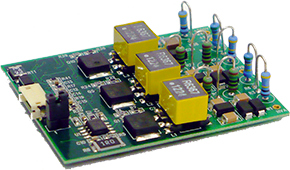 Trek, Inc., a leading provider of high-voltage amplifiers, supplies this custom-designed amplifier to meet the requirements of Smart Material's P1 type MFCs. The design of this custom amplifier is based on the renowned Trek amplifier technology. With an output voltage of -500V to +1500V and a maximal output current of 50mA the PA05039 is designed to drive several P1 type (d33 effect) MFCs. The high voltage output is controlled through an amplifier input voltage of -2.5V to 7.5V DC or peak AC. 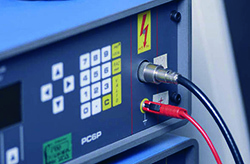 Physical instruments is a specialty provider of high voltage power supplies and amplifiers. The customized MFC model HVA 1500/50 meets the requirements for driving P1 type MFCs. With an output voltage of -500V to +1500V and a maximal output current of 60mA AC, the HVA 1500/50 is designed to drive several P1 type (d33 effect) MFCs, including static driving setups. The high voltage output can be controlled via a -2.5V to +7.5V control input with a fixed multiplicator of 200, or with a separate audio input with additional gain and offset control. The model family HVA 1500 is also available as a multi-channel version with 2, 3, and 4 channels. Each channel can be operated separately and features the same specification as the single channelHVA 1500/50. The multi-channel HVA 1500/50 comes in a high 19" rack casing. Texas Instruments DRV2700EVM-HV500 is an evaluation module for the DRV2700 and used in a flyback converter circuit. The DRV2700 is intended for high voltage piezo applications typically used in industrial applications. The integrated high voltage switch enables a small solution size circuit that can drive 500V single-ended. 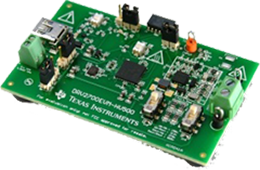 The onboard MSP430 allows for digital control and quick prototyping. The DRV2700 is a single chip, high-voltage piezo driver with an integrated 105V boost switch, integrated power diode, and integrated fully-differential amplifier. This EVM allows the designer to evaluate and appropriately prototype it into their design. The kit comes with a GUI control software. The DRV2700 and the Evaluation Module are capable of driving P2 type MFCs. PWM input: In this mode, the onboard MSP430 generates a PWM waveform that is sent through the low-pass input filter to the DRV2700. Analog input: An external source of 0-Vdd supplies an analog waveform which is sent through the low-pass input filter to the DRV2700. Please order and look up additional data directly on Texas Instrument's website. 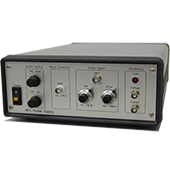 The AMT2012-CE3 is a triple output power supply with one fixed 500V output, and two variable output from 0 volts to 2 kV. This power supply is specifically designed for Macro Fiber Composite (MFC) applications. Use of the bias supply allows a range of -500V to +1500V to be applied to the MFC. The AMT2012-CE3 possesses a direct analog interface and a PWM input interface. It is also designed for battery operation and requires a DC supply voltage between 8 and 15V. 4 watts of peak input power during charging. Charge time for a 5 nf capacitance load is less than 10 ms from 0V to 2000V (-500 to +1500V measured on the MFC). Input Voltage 8 to 15 volts DC. Reverse polarity protected, includes a self-resetting (thermal) fuse. The control input provides a linear function of input voltage to output voltage for the 2 kV power supply. The control input operates over a 0 to 5 volt range for a 0 to 2000 volt output (factor 400 amplification). An enable input shuts down all outputs to save power consumption and for safety. Mechanical dimensions are 2” x 3”. Height will not exceed 1 inch for the tallest components (located on one edge of the PCB). Components are mounted on both sides of the PCB. The AMD2012-CE3 is a dual output power supply with one fixed 500V output, and one variable output from 0 volts to 2 kV. 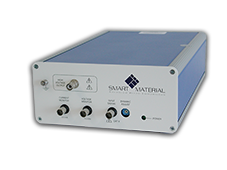 This power supply is specifically designed for Macro Fiber Composite (MFC) applications. Use of the bias supply allows a range of -500V to +1500V to be applied to the MFC. The AMD2012-CE3 possesses a direct analog interface and a PWM input interface. It is also designed for battery operation and requires a DC supply voltage between 8 and 15V. 4 watts of peak power during charging. Charge time for a 5 nf capacitance load is less than 10 ms from 0V to 2000V (-500 to +1500V measured at the MFC). The control input provides a linear function of the input voltage to the output voltage for the 2 kV power supply. The control input operates over a 0 to 5 volt range for a 0 to 2000 volt output (factor 400 amplification). An enable input shuts down all power outputs to save power consumption and for safety. Mechanical dimensions are 2.2” x 1.25”. 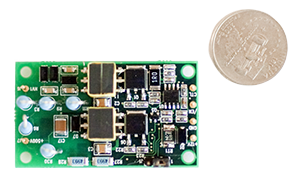 Height will not exceed 0.75 inch for the tallest components (located on one edge of the PCB). Components are mounted on both sides of the PCB.